The biggest city and the capital of Cambodia, Phnom Penh is situated in the south central region of this country, on the bank where Tonle Sap river flows into Mekong river providing natural resources and fresh water to this city. The name “Phnom Penh” derived from Wat Phnom Daun Penh meaning “The temple on hill” established by miss Daun Penh – a rich relict. And Phnom Penh is the sixth capital of Cambodia after many times relocating capital. 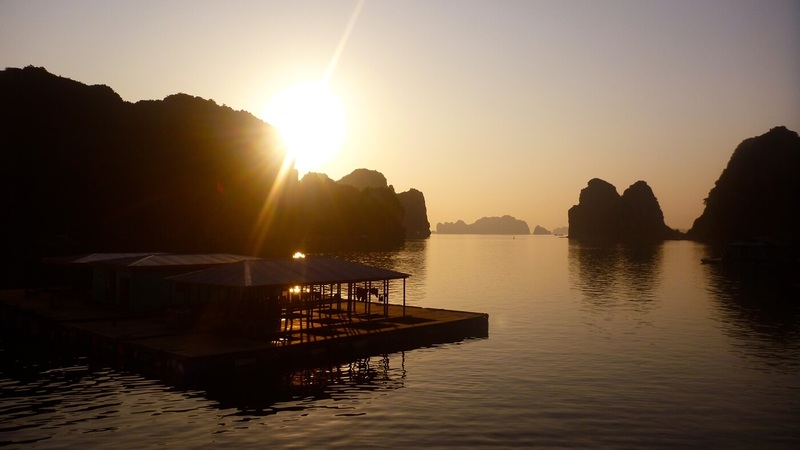 The climate of this city is similar to Ho Chi Minh’s climate in Viet Nam with 2 seasons in year: rainy season and dry season with the average temperature in year is high so tourists usually visit this city at the time from November to February the following year when temperature are lower. 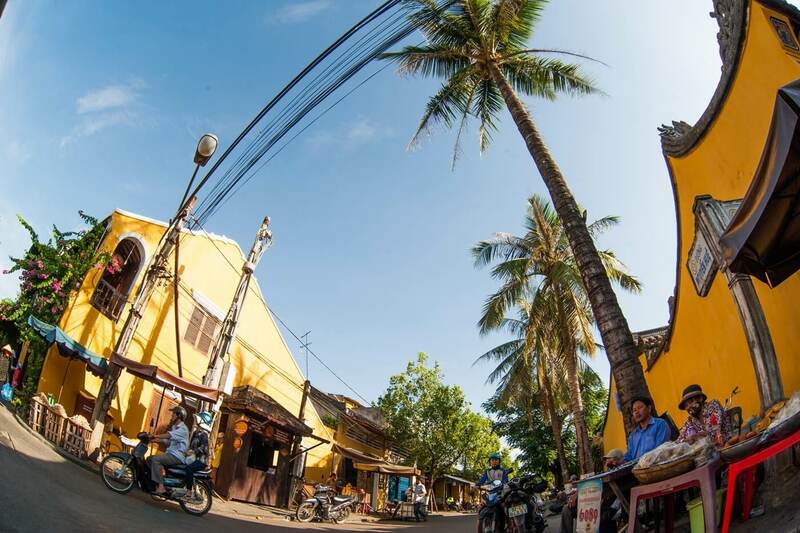 With the area of 678,5 square kilometres, Phnom Penh is an important political – cultural – social – economic center with many buildings and constructions are influenced by French architecture and Khmer’s identities having historical beauty. Exotic shopping, unique dining and bustle nightlife are interesting chances tourists can’t help to refuse when visting this beautiful city. The Royal Palace in Phnom Penh, Cambodia, a complex of buildings where famlily of the King of Cambodia stayed, was constructed in 1860s at the Western bank of the cross division of the Tonle Sap River and the Mekong River, on Sophanuvong avenue and faces to poetic Tonle Sap River after the royal capital was relocated to Phnom Penh. This palace is a place for performing rituals, court ceremonies and nowadays it serves as home of King Sihamoni, so parts of this palace are closed to the public. The ticket to visit this palace costs 3USD, it’s expensive but worthy of a symbol of Cambodia. Tourists should wear swish clothes to respect the maestro of Royal Palace. Royal Palace is a typical example of Khmer’s architecture with system of Layout of the defensive wall which is very high and attracting with sculptural motifs like pagoda tree leaf, Throne hall, temple, pagoda, tower with yellow pyramid architecture being prominent in the skyline and mural painting. All of this constructions are decorated marverlous and sparkling, noise of human life is kept outside the defensive wall and the atmosphere of this palace is always quiet, majestic and peaceful. The representative constructions of this palace is Throne Hall which contains throne of the King with special dome architecture describing Reamker epic, Moonlight Pavillion which serving the performance of kingdom dance or important party of the kingdom and Silver Pagoda. Silver Pagoda, located in the campus of Royal Palace, to the North side of this palace compound. The official name is Wat Preah Morakat but it’s usually called “Silver Pagoda” because the floor of which is covered with over 5.000 silver tiles and each tile is handmade. The Silver Pagoda was constucted in 1962, which conserve and save more than 1600 religious antiquities. At the centre of this pagoda, there is an amazing Bacarat crystal Buddha with the height approximate 30 meters. In front of this statue, there is a huge solid gold Buddha, which has a weight of 90 kilograms and was attached over 2000 diamonds, and because of this Buddha, sometimes Silver Pagoda is called “Golden pagoda”. In addition, there is a Buddha located in small silver – golden tower and many antiquities of the Royal family. The most attractive point of visiting Silver Pagoda is contemplating architecture of this place, which reflects Khmer’s culture and history. In the main hall, the surrounded wall is decorated with patterns about Reamker epic. Next to pagoda, there is a small library, which contains solemn bible. Tourists also have chance to contemplate Noradom King riding horse statue to honor the venerable King of Cambodia. 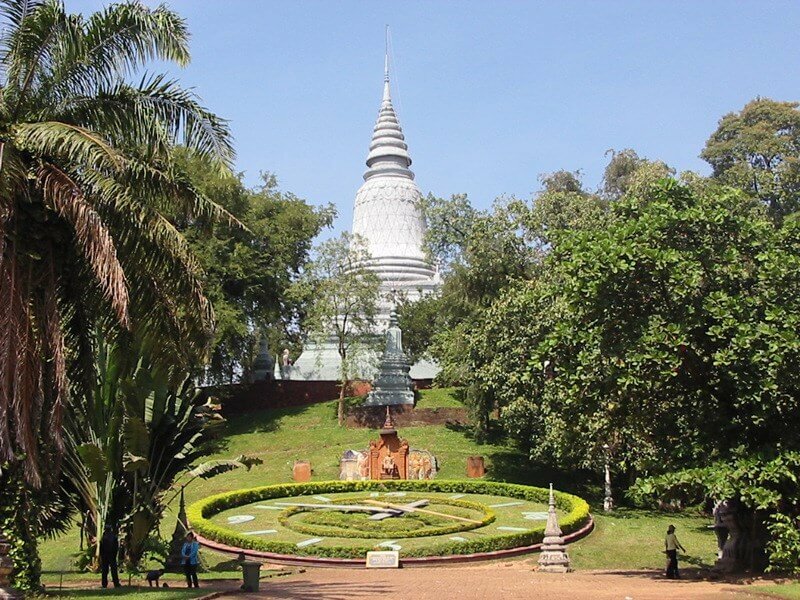 Besides, there are many constructions for tourists to visit in Silver Pagoda like Mondop hill, Keong Preah Bat – the tower contains Buddha’s foot sign, Ring Tower and many mausoleums of Kings, Queens and Princesses. 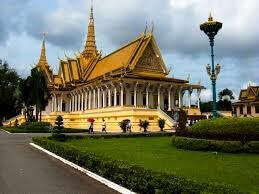 Wat Phnom, a Buddhist Temple, was constructed in 1373 in Phnom Penh, Cambodia. It’s the highest and the most important religious structure in this city at the height of 27 meters. The temple was built in 1373. It is the highest religious building in the city. Temple was a wealthy widow Daun Chi Penh, built on an artificial hill, after a great flood had washed away the Buddha statue here. She has sent his servants to fill a hill and a small temple in the area that is now known as Wat Phnom. A sacred Buddha statues in Wat Phnom led a growing population moving to live around the temple and gradually formed a community, the predecessor of the capital, Phnom Penh. 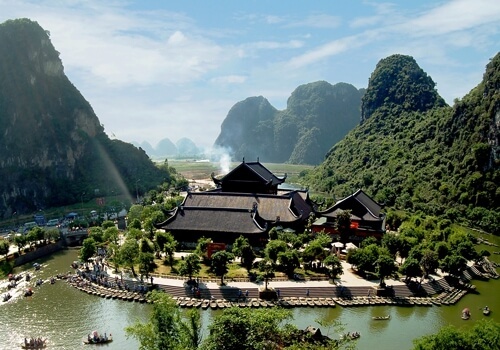 This is the sacred temple attracts pilgrims from all over the country and it is also the sight that not to be missed by tourists when traveling to this country. Temple has two directions for sightseeing. Tourists visit the temple will go in one way and get down in another way. The path to the temple is not high, it also has a statue of the god snake Naga and two statues of the god lion. These mascot are familiar in the beliefs of local people in Cambodia and they are also seen mostly in the Angkor temples. 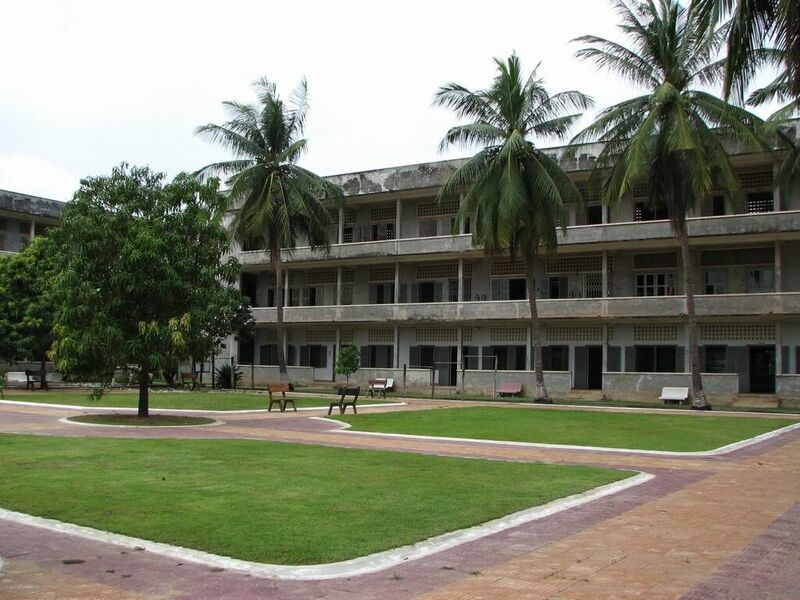 Tuol Sleng Genocide Museum is a genocide's museum during the Khmer Rouge rule from 1975 to 1979. The museum currently hide small neighborhood of Tuol Svay Prey in the south of Phnom Penh and it is pretty inept with the surrounding landscape because it is too old and degraded with the barbed wire fence surrounding it. According to the dictionary, the Tuol Sleng in Khmer means as a Potions Hill, the name associated with its history. Tuol Sleng was a school, but the Khmer Rouge used barbed wire to crank the region, and turn the classroom into a tiny cell to torture prisoners, became a concentration camp of the genocidal Khmer Rouge. Museum preserves artifacts found after the Khmer Rouge was controlled on May 01 1979. In the prison, there are a lot of documents and thousands of photos of the victims, many of them still exhibited. The picture of torture in prisons which are exhibited were made by Vann Nath. He is one of the Toul Sleng prisoners in survival. 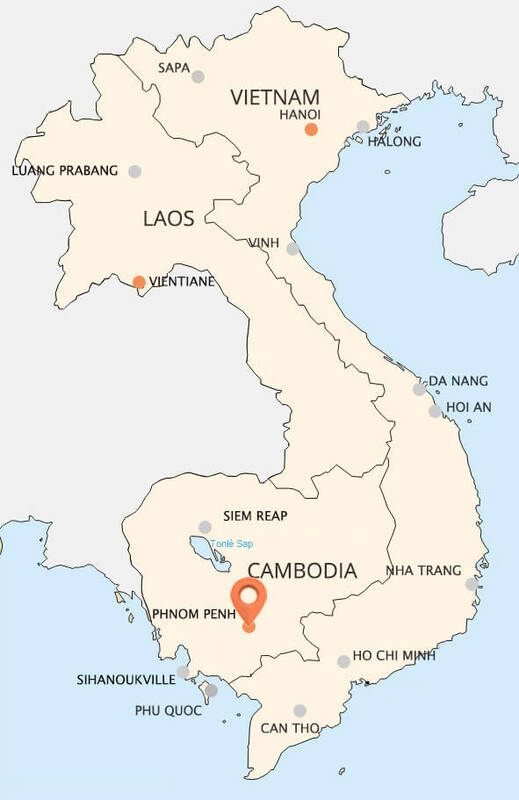 The Cambodia map made from skulls of victims is not being exhibited in this museum because some suggested that it is too cruel. 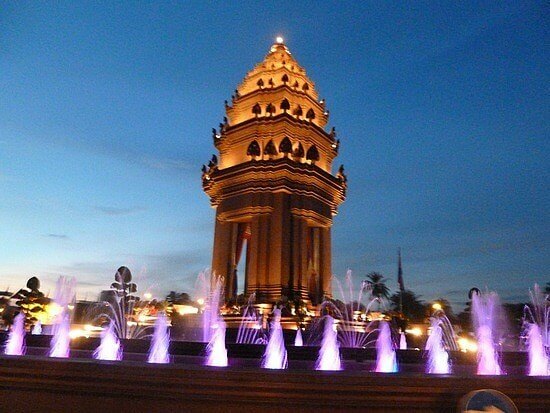 Independence Monument is a memorial in the capital Phnom Penh. 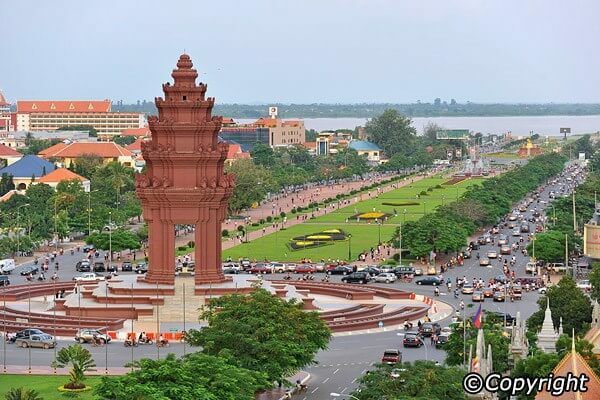 This construction was built in 1958 and inaugurated in November 9, 1962 to celebrate 9 years since the day Cambodia take back their freedom from the French. Independent Monument is seen as landmarks attract visitors when they come to Phnom Penh. This monument is the work of a Cambodian architect, Vann Molyvann. He used almost of all the traditional motifs of ancient Khmer architecture. This monument is shaped stupa, modeled on Angkor Wat and a number of other historical relics of Cambodia. The result is a large tower, slim and tall. On the top, the roof section is gradually more tapering, leaning a lotus buds, typical of popular architecture of Cambodia. Architect Vann Molyvann affected modern style to the shape of monuments so this construction bear the hallmarks. Independence Monument is located in large square at the intersection of two roads Norodom Sihanouk in the center of the capital. Visitors do not have to pay to see, but when the Independence monument was used as the stage for an important festival, visitors will be prohibited from entering.